What can a music critic say about The Borromeo String Quartet that hasn't been said before? 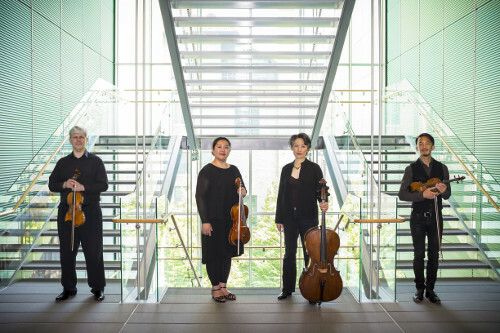 In his March 2015 review, CVNC critic Jeffrey Rossman said, "... the Borromeo String Quartet is not only the finest playing today but is well within the top five chamber music ensembles of all time." While I strongly dislike having to choose a "number one" or "GOAT" (Greatest of All Time) in anything, no one can deny this quartet a place in the pantheon of truly great ensembles. This concert of quartets by César Franck, Charles Ives, and Claude Debussy could only add more luster to this group's image. Growing up in Washington, DC, the Library of Congress concerts by the Budapest and Julliard String Quartets exposed me to "A-List" quartet playing; the Borromeo Quartet is the equal of any I've ever heard. So given that any ensemble in this league plays all the right notes and rhythms well and usually with élan, what separates the Borromeo musicians from the others? A Biblical phrase (St. Paul) comes to mind: they play "with the spirit and with the understanding also." While Nicolas Kitchen, Kristopher Tong, Mai Motobuchi, and Yeesun Kim are all artists in their own right, their interaction with each other, intensified by the years they have been together, makes their sum greater than their parts. To see them play is like seeing the inner parts of a watch movement. The subtle eye contacts, the slight tilt of a head, the direction of a bow: each communication, though unheard, affects their sound. The result is that they are not simply performing a musical work: they are creating a musical work, as if they are channeling the composer's own genius. They play as one, the slightest piu mossos, crescendos, diminuendos, rapid pizzicatos all executed in perfect unison. What does this produce in terms of the music? This afternoon, for starters, a scintillating Franck quartet which simply could not be surpassed: you will never hear a better performance. From the opening measures, where Kitchen's Guarneri del Jesu violin's radiant sound soared out in the first of the many themes which Franck weaves throughout the four movements of this quartet, through the shadowy skittishness of the Scherzo, to the commanding fortissimos of the finale, this was a definitive and consummate realization. The same can be said of Ives' quirky 2nd String Quartet, perhaps the antithesis of the French quartets which preceded and followed it in this imaginative program. Ives believed that the current rules for composition of string quartets produced music which was "trite, weak, and effeminate..., too much tied to the old ladies" (as quoted in Joseph Kitchen's program note). Ives described the quartet's program as one "... for 4 men – who converse, discuss, argue (re: Politick'), fight, shake hands, shut up – then walk up the mountain side to view the firmament!" In the "Arguments" movement, Ives music perfectly predicts our current Congressional situation, as each "side of the aisle" states its point; some voices of reason urge compromise; those voices disappear as the two sides retreat to their initial arguments. Each instrument then says the same thing, but at different times until the argument ends in gridlock. The Borromeo performance made sense of what could otherwise be heard as random dissonance. The final chord of the last movement, with its major and minor thirds, had the perfect weight for each pitch, making those thirds not a combat, but simply an "either-or" choice. Unlike the Franck and Ives quartets, Debussy's sole work in this form is a staple of the string quartet repertoire. It makes different technical demands on the players (e.g., the peripatetic pizzicatos of the second movement) as it conjures up the Impressionist paintings of Monet and Manet. Both middle movements showcased solo viola lines, superbly played by Motobuchi. The closing bars of the third movement (Andantino, doucement expressif) were ravishingly beautiful, a shimmering chanson with plainsong-like melodies, dissolving into an ethereal pianississimo.The bravura close of the Très vif finale brought the audience to its feet. If you want to hear unsurpassed musicianship, virtuoso technique, and a unique unity of performance, go to a concert by The Borromeo Quartet!